After spending the previous two days on the Arizona Strip, I was back in Utah again and taking taking an easy day off from hiking. I decided to visit the South Fork Indian Canyon Pictographs since it was a short hike at the end of a sandy road. There were many colorful pictographs found in the alcove here and this photo just shows a few of the interesting ones. There are the Yellow Twins one the left side, with an unusual white and yellow circular design below them. To the right is a small square-headed anthropomorphic figure. 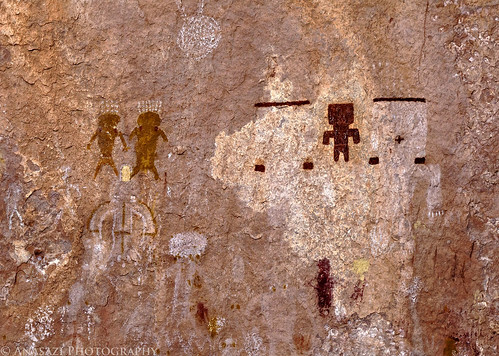 It appears that the small red squares below this figure might have been part of larger white anthropomorphs. You can see part of the head and arm of the one on the right that still survives. It was a very interesting site to visit.